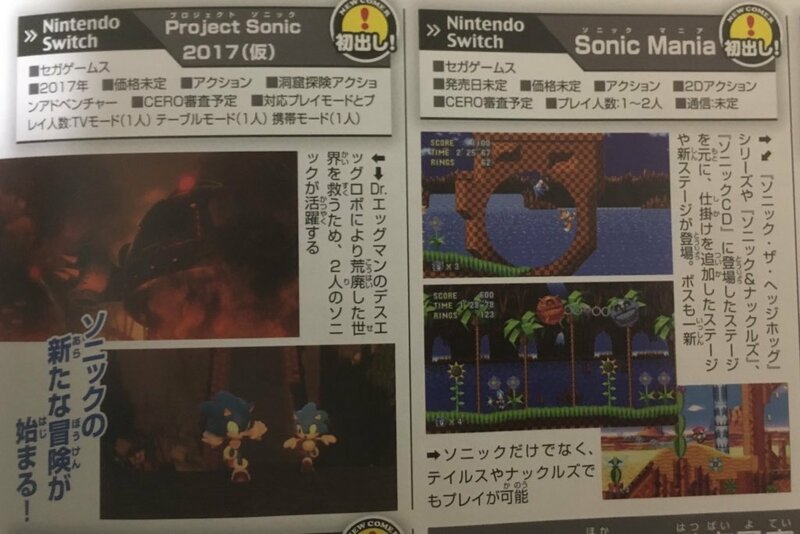 A scan popped up on Twitter today from Nintendo Dream magazine in Japan showing bits of info for both Sonic Mania and Project Sonic 2017 on Nintendo Switch. 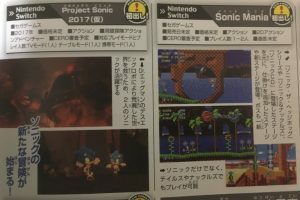 While nothing of note was said of Sonic Mania, we got a few small bits about Project Sonic 2017, but nothing mind-blowing. The Switch version is 1-player-only and supports “all kinds” of the Switch’s play modes, one specified naturally was “TV”, but other Switch modes (though not mentioned by PushDustin) are Tabletop-Mode and Portable mode. So far the latter two weren’t specified, but there’s no reason why this would not be the case for the game. It’s an Action-Adventure game, but curiously it’s literally listed as a “cave exploring action adventure game”, but PushDustin notes not to take that literally. You have to protect the world from devastation from Eggman’s Death Egg Robots using 2 Sonics. Lastly, PushDustin just says “Sonic’s new adventure begins”. As said, this is nothing mind-blowing, we’ll likely get our first major bits of info from the upcoming SXSW panel on March 16th for Project Sonic 2017. Special thanks go to BlueParadox for posting the scan, and again to PushDustin for the translations. Still interesting for sure. Thanks! I”m so looking forward for that on Nintendo Switch! Can’t wait for more details. Even though it’s a single player game, I hope they still give us the option to do free-play with other characters while keeping Sonic(s) the sole playable story-characters. It’d be a nice way around the issue of having to write multiple scenarios while still satisfying that fan desire for variety. Though more than anything I’d really like to see them refine the Sonic gameplay down to a science once again this time around. If it isn’t the return of the Boost formula like most people have been speculating, then at least give us a worthier successor. In Black Knight, you could play as Knuckles, Shadow and Blaze once you got to the second half, but only if you absolutely wanted to. That’s all this game needs to do, really. Not mind-blowing, but at least it’s still SOMETHING. Not much, but just enough for a tad of speculation. It’s the Action Adventure thing that gets me. I wonder if that means a return to the more…action-focused gameplay of the past. Otherwise they would have just said something like “speed-focused platformer”. Am I overanalysing this? I am pretty bummed about there being no multiplayer, and I’m also sad that it seems like only Sonic will be playable… but it’s nice to hear news regardless. Plus, no multiplayer means that they are putting more focus into a great single player experience… right? Agreed, it would be nice to see other characters playable, doesn’t seem likely at this point but who knows? This is probably very early info though, also I get the feeling that this may not be Eggman’s doing as well, but then who is behind this? Maybe Eggman Nega or Metal Sonic. Me too! Also he has proven to be more maniacal and diabolical than Eggman so it would be great to see what scheme he comes up with, also it would be a nice way of involving Blaze and Silver if they are planning on including more characters. From what I’ve heard, Sega in general aren’t that outgoing in the sense of revealing news or what the company’s like in general so getting spoilers or inside stuff is pretty difficult anyway, even moreso since the restructuring. Sonic Team as a whole have kept Project 2017 at least shrouded in mystery, we don’t know the gameplay style, the story or who’s involved we’ve just been teased segments of news, so far we can only make assumptions off of one trailer. I had a thing a while back now where it seemed like the trailer was using game ready assets and that Marza’s animation was more akin to the gameplay we’ve seen before but it is just a theory so anything could happen. Anyway… High hopes for this team for the future. Given the time and the right people, they always surprise me. I would hate this game more than any other Sonic game ever. Not really feeling that concept either to be honest. Not saying it couldn’t work but speed/momentum and real time strategy don’t look like they’d mesh well together. Closest thing to that was Sonic Chronicles, which was enjoyable in some areas but just felt slow in some areas. I never finished the game but I’ve watched playthrough’s which seem pretty good. Me personally I would have liked to see a game that showcases Sonic’s acrobatics we normally see in cut scenes, since the scale and spectacle of his world mesh well with the whole freedom feeling they give off. Sonic Lost World if you manipulated the controls well let you do that stuff but there weren’t many places to pull them off. I think the Prototype games style of play in terms of free roam would suit Sonic well, even a translation of Ori and the Blind forest’s acrobatics into a 3D environment could be interesting. That’s just me though. Sonic games may be inconsistent but I’ll take experimentation over samey anyday so long as it’s within the realms of what the series is known for.